1. Fill a copper mug full with crushed ice. 2. Add vodka, lime juice then ginger beer. Give it a gentle swirl and serve garnished with a slice of lime. 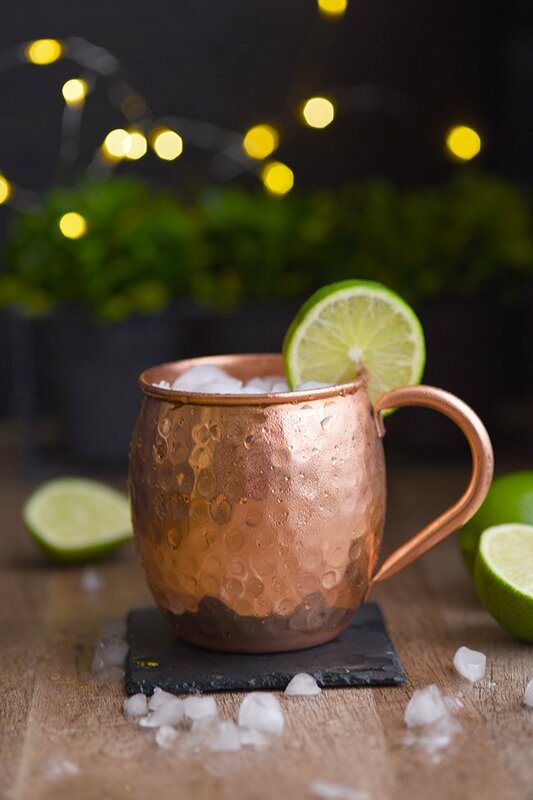 If you are trying to achieve the full Moscow Mule experience, get a set of solid copper Moscow Mule mugs. Solid copper is a must. Especially if you’re giving these as a gift. Don’t be like me and unknowingly give stainless steel lined mugs. They just aren’t as cool, literally. See, the whole deal with the copper mug is that copper cools quickly to match the temperature of the drink and offers your lips a chilled surface to sip this refreshing cocktail. So if you were wondering why Moscow Mules come in a copper mug, there’s your answer! It also just makes a nice presentation for an otherwise pretty colorless drink. Shop solid copper Moscow Mule mugs on Amazon. First of all, ginger beer and ginger ale are not the same. I suppose you could sub in ginger ale if you had to, but ginger beer is much spicier and really adds to the overall flavor of the Moscow Mule. (If you want an in depth explanation of the difference between ginger ale and ginger beer check out this article by Huff Post.) So definitely pick up a bottle or a six pack of ginger beer if you’re wanting to achieve the same authentic taste you get at a restaurant. You can also make a Dark & Stormy cocktail with ginger beer! Moscow Mules are actually really easy to make! There are only three ingredients in a classic Mosow Mule. That’s it! So, it’s really pretty easy to whip up your own Moscow Mules at home. Once you get the basic recipe down, you can experiment with adding other fruits in to flavor your drink. You can add in a splash of just about any kind of juice you can think of that goes with lime or substitute a lemon and find a fruit that pairs well with lemons. For an added touch, garnish with fresh fruits to match your splash of juice. This easy Moscow Mule recipe was featured on Wine’d Down Wednesday!